This advanced unit is a powerful addition to a Syvecs or Life Racing ECU. 4 additional inputs with configurable pull-up resistors, suitable for all sensor types; capable of speed measurement (e.g. for ABS wheel speed sensors). H-bridge output which can be configured as a single full bridge or two independent half bridges. Suitable for drive-by-wire throttle control, for example. The MEU enclosure is an industry-standard Deutsch enclosure, moulded in Thermoplastic and rated at IP67. 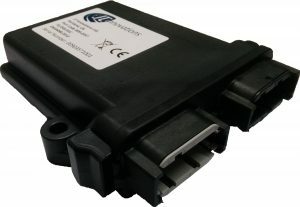 Connects via single pair CANbus direct to ECU. Life Racing/Syvecs “slave mode” which *cannot* be used for other devices at this time, but allows free use of the inputs for any purpose, as well as full GPS information (co-ordinates as well as speed etc.). Life Racing/Syvecs GPS-AG50 mode, with full GPS data (latitude/longitude/speed/course) with accelerometer and gyro data. H-bridge driver can be controlled by the generic transmit datastream, but use of the inputs is limited to the barometric pressure sensor, EGT and Bosch lambda via S8/F88 generic receive (not S6). The 4 main inputs – at this time – are not accessible, but this mode does allow other CAN devices, such as a dash or Toucan to be connected. The CANbus has an internal 120Ω termination link (which can be removed via internal jumper link). The MEU is equipped with a pair of 12-way Deutsch DTM connectors, and is supplied with the mating housings and a set of DTM terminals. The GPS antenna (supplied) uses a standard SMA jack connector. Analogue input speed measurement Up to 1.8kHz. Hall effect/3-wire type or VR type (e.g. 2-wire ABS sensors). H-bridge Current Continuous 5.0A, peak 7.0A. GPS Antenna (supplied) Active omnidirectional antenna (powered via MEU) with adhesive pad. Lambda amplifier Internal selection for LSU4.9 (default) or LSU4.2. Lambda Heater control. PID control to maintain accuracy. Connectors (supplied) Deutsch DTM 12 way. 1x "A" coding, 1x "B" coding.